This is 9x18 Makarov Fiocchi 95gr. Full Metal Jacket Ammo. The development of these products focused on the achievement of synergy between shooter, firearm and ammunition. Fiocchi has successfully met and surpassed this goal with its pistol shooting dynamics line. The high volume shooter will be pleased with the balance created between reliability, power, precision and affordability. 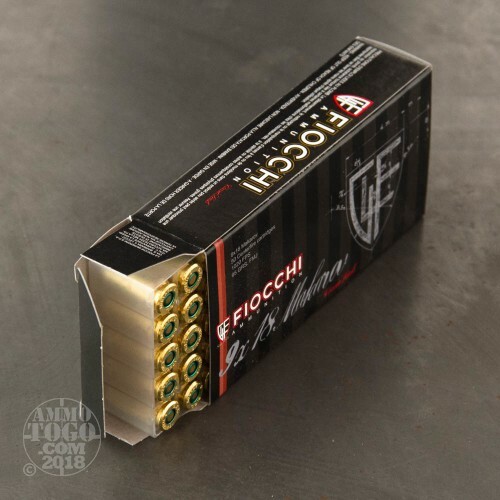 This ammo is 100% reloadable, brass cased, and boxer primed. This ammo comes packed in 50rd. boxes. Fast shipment. Clean un-damaged packaging. Shoots well through my Bulgarian Makarov. No trouble at all with this ammo. 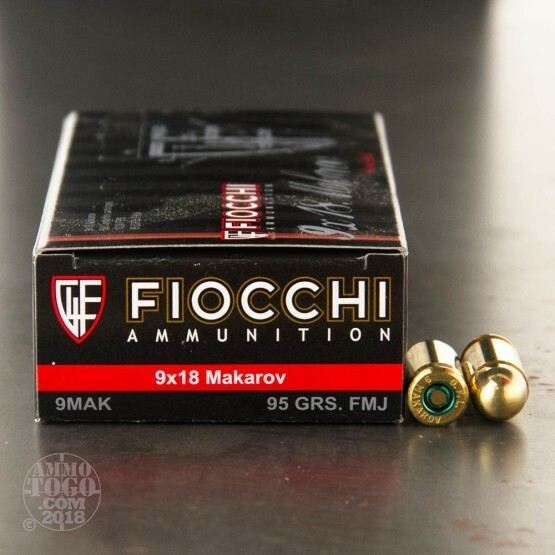 Have never had a problem with any type of Fiocchi ammo, and this one shoot wonderful in a Makarov. Plus good and fast shipping from ammo2go. Excellent ammo. Hard hitting and clean. Brass is great for reloading. Can't go wrong with it. Ordered on Monday received on Wed. GREAT SERVICE VERY GOOD PRICE!!!. 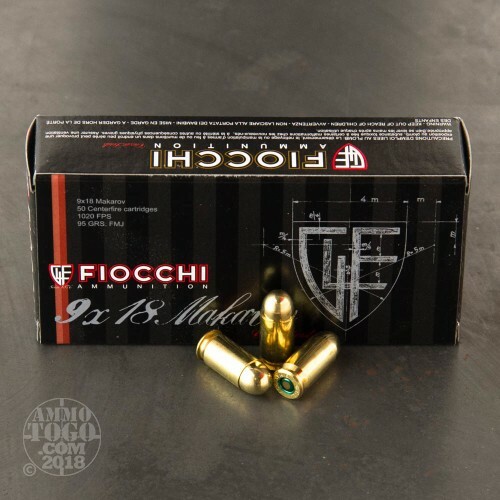 I haven't shot yet but never had a problem with Fiocchi. will use this Sat in a concealed carry match. What’s the Difference Between the 9mm Makarov and the 9mm Luger? A lot. While they are both “9mm” cartridges, the 9mm Marakov was designed by the Soviets with the specific purpose of not being interchangeable with 9x19 ammunition. In the event of a shooting war between the Soviets and western powers, it couldn’t be captured and used by NATO troops. In fact, they have slightly different bullet diameters (9.27mm for the Marakov, 9.01mm for the Luger) as well as different neck and base diameters. Most notably, the Marakov is slightly shorter, with an overall length of 25mm compared to the Luger’s 29.69mm. Because of the larger case, the 9mm Luger tends to have slightly faster velocities and energy, although the energy is due in part to the larger bullet weight. Can You Fire 9mm Makarov in a .38 Handgun? No, but that's a common question. 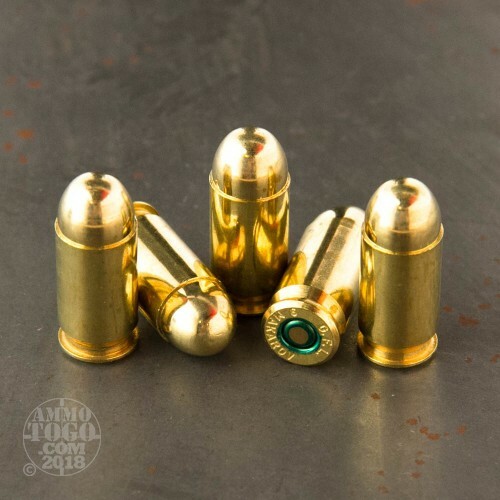 Because a 9mm bullet is close in size to a .357-caliber (which includes the .38 Special and ..357 Magnum), people often wonder if you can shoot the 9mm Marakov through firearms made for “.38’s.” However, the bullet diameter of a 9mm Marakov is exactly .365 inches, and while less than a hundredth of an inch may not seem like much, it will make a vast difference in the performance and functionality of the bullet. In general, the 9mm Marakov is a unique bullet and should not be interchanged with other rounds, especially ones the come from North American and Western Europe. What Firearms Use the 9mm Makarov? This cartridge is used mostly in pistols. In fact, it is difficult to find anything but pistols that load this round. This is because the cartridge was developed for sidearms used by Soviet-bloc military personnel. It can be fairly difficult to find firearms that take this round, as most of the weapons are of Russian origin and are not found in great numbers in the United State. This is in contrast to the 9mm Luger, which has many readily-available weapons at stores all across the country. The cartridge was meant to be used in submachine guns carried by Communist soldiers, but these were less common because of the effectiveness of the AK-47, which loaded a different cartridge. What are the Top Uses for 9mm Makarov Ammunition? The 9mm Makarov can be used for many different purposes, but it’s often used for target shooting; it’s also sometimes used for self defense. For self-defense purposes, it is a consistent and reliable weapon with excellent penetration and expansion, assuming the right bullet is used. For self defense, you should select an expanding round such as a jacketed hollow point 9mm Mak load. For target shooting the cartridge remains popular and accurate. For this purpose, a full metal jacket is ideal for smooth cycling and less barrel fouling.